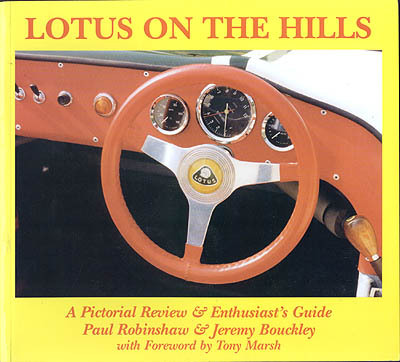 This is an 8-inch by 9-inch wide 132 page soft-cover book created entirely of black & white photographs and a bit of text covering all models of Lotus, all shown climbing... hills. This is the second book written by Paul Robinshaw and Jeremy Bouckley, published by R.B. Publications (Robinson and Bouckley perhaps?? ), 1 Guys Cliff Avenue, Sutton Coldfield, West Midlands B76 2QE, England. ISBN number 0 952 8086 2 5. Not surprisingly, as the book covers all models of Lotus, Cortinas are not given much space. In a section titled "The Saloons: Cortina & Sunbeam", 3 black & white photographs of 2 different MKI Lotus Cortinas are shown on page 80, an uninformative chart of "data" is included on page 81, and 2 black & white photographs of the same MKII Lotus Cortina (with cool front air-dam, shown below) are on page 82. That's it. It appears to be out of print, but many copies are available through used bookstores, discount and remainder stores.